The Tumbleweed Mouse is a breed of mouse found in the Claw Shot City. This mouse is also a part of the Travelling Terror gang when working on a Wanted Poster. 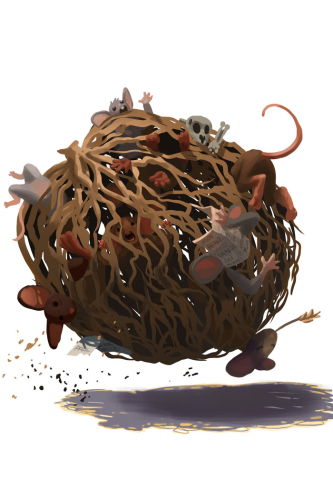 Tumbleweed mice are not actually mice per se but rather a rudimentary form of mousey transportation, often crammed full of squealing mice. Unfortunately for the mice, they don't always get to control where these vehicles tumble nor if they even want to ride in one or not. Usually these gnarled twig cages come rolling out of no where, nabbing mice as it rolls over them and randomly flinging them out when the wind causes it to pick up enough speed. Still, for the undiscerning mouse, this is considered the number one form of public transportation in Claw Shot City, but... that might also be due to the fact that it is the only form of public transportation available. Tumbleweed mice have no specific preference for any kind of cheese. Law type traps such as S.L.A.C. are very effective against Tumbleweed Mouse. The Tumbleweed Mouse was painted during an Art edition of Feedback Friday and incorporated suggestions provided by Hunters during the broadcast.